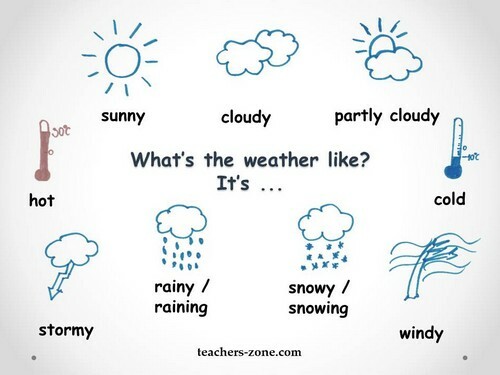 On the Teacher's Zone website you can find new teaching resources for weather vocabulary. There are weather flashcards, worksheets to practise weather vocabulary and a poster with types of weather. All teaching materials for ESL kids you can download for free. Here are two sets of weather flashcards. You can choose weather images or pictures with labels and phonetic transcription. Click the image below to download free flashcards and teach ESL kids how to ask and answer about weather. Introduction of new vocabulary should be followed by lots of practise. Try these printable worksheets for weather vocabulary which are related to the flashcards. 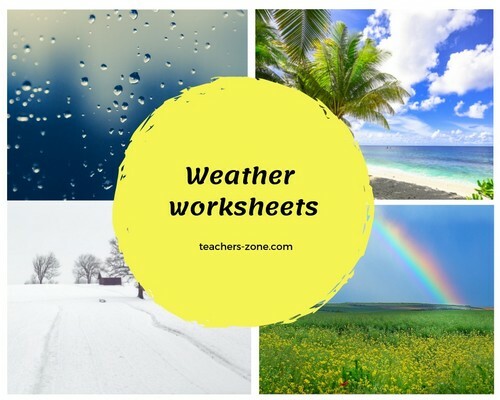 Click the image below to download weather worksheets. You can use this poster to consolidate knowledge of weather vocabulary. You can print and attach it to the class bulletin board and use it to ask the question about the weather as a class routine. Click the image below to download the weather poster. Enjoy new weather teaching resources from the Teacher's Zone website! Leave a comment if you find them useful.